There’s no doubt about it— when it comes to stressful life events, moving is almost as anxiety-provoking as divorce or death of a spouse, especially when it’s relocating an older adult to an assisted living community. Even though the move may make sense in terms of safety and security, the decision can’t be viewed solely through the lens of practicality. Many older adults feel grief about moving from a much-loved home and neighborhood into an unfamiliar environment. Then too, they may see moving as a sign of defeat and a harbinger of increasing loss of independence and choice, especially if they have dementia and cannot participate in the decision-making process. 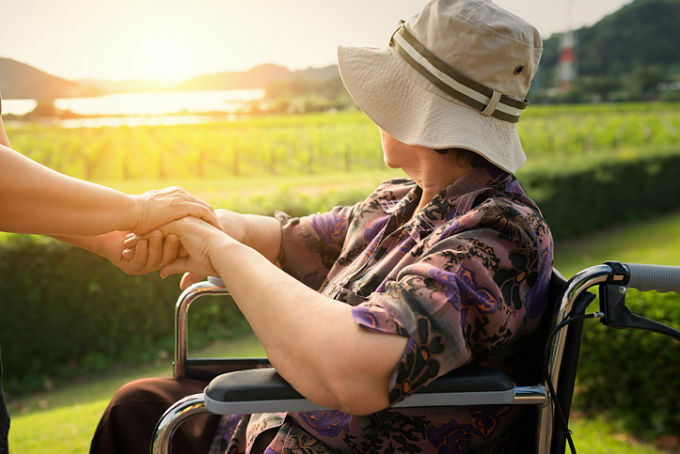 Although moving your parents to assisted living may come with its challenges, there are ways you can make the transition a little easier. Here are eight tips to help smooth the way to the next phase of your loved ones’ lives. 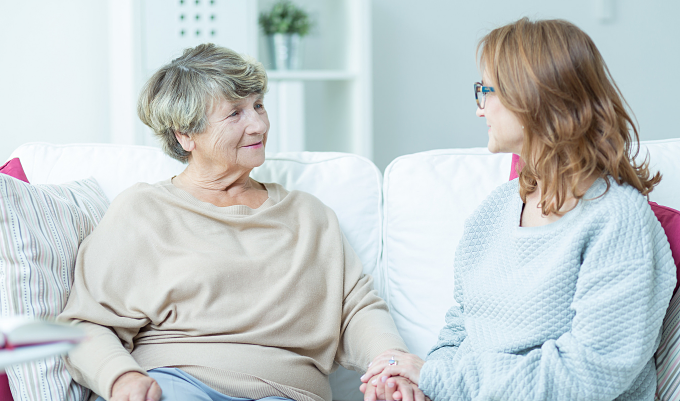 Although you may be anxious to focus on practical matters, the transition will go more easily if you spend some time talking to your aging loved ones about their needs, fears and hopes. 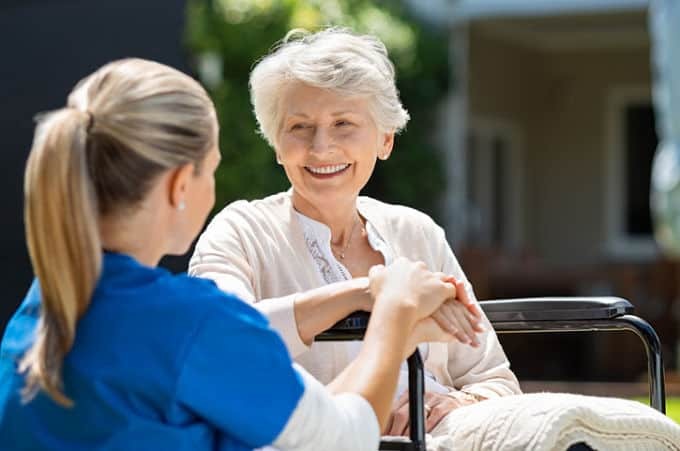 Once you’ve acknowledged and (hopefully) addressed any concerns about moving, have a conversation that centers around the benefits of assisted living—like living in a community and having easy access to new activities and events. If you can help your parents see a move as a positive transition rather than a defeat, you’ll be off to a good start. A crucial step that will enable you to get clear about the kind of care your parents can afford, is ensuring that their finances are in order. (In fact, many continuing care retirement communities and assisted living places require thorough documentation of income and assets so they can be sure residents can keep paying over the long haul.) If your parents don’t have an accountant who can help pull the paperwork together, the Society of Certified Senior Advisors can refer you to a financial planner who specializes in assisting older clients. If one or both of your parents have significant health concerns, deciding on the best kind of community is a medical decision as well as a personal one. If your parents’ family physician cannot evaluate them and make a recommendation, ask for a referral to a geriatrician (a specialist who focuses on the health care of elderly people) for a full evaluation. In most areas of the country, there’s a wide range of eldercare housing options. A good place to start is Caring.com’s senior care directory, where you can search for assisted living communities, continuing care communities, memory care and nursing homes in your area. Once you’ve narrowed down the list, tour the communities with your parents. On your tour, ask lots of questions, and take note of whether the community is bright, cheerful and well-maintained. (This checklist details some other features to look out for.) At each community, make sure to talk to residents, eat a meal, and get the feel of the place. Of course, don’t neglect to ask your parents for their gut feelings as well. If you feel overwhelmed or don’t have the time to help organize your parents’ move, consider enlisting a professional geriatric care manager, who can assess the level of care your parents need, find senior communities, navigate the application process, and prepare for a move. Their services can be especially useful if you don’t live in the same state as your parents and can’t manage the day-to-day aspects of the transition. An alternative is to bring in a senior move manager, a professional who specializes in the transition and relocation of older adults. Yes, those long contracts can be overwhelming, but don’t give in to the temptation to skim documents before signing (or asking your parents to do so). The contracts and agreements that come with moving into any kind of community may well spell out the parameters of the care they will—or won’t—receive for the rest of their life. It’s crucial you and your parents understand exactly what you’re agreeing to before putting pen to paper. If you spot something worrisome or have questions the community can’t answer to your satisfaction, the National Academy of Elder Law Attorneys can refer you to a lawyer who can go over the paperwork with you. Unless your parents already live in a small apartment or condo, they will have to let go of many furnishings and possessions to fit into a new, smaller space. Start downsizing and dealing with belongings as soon as possible to avoid moving day chaos. Organize a moving sale and/or sell items on Kijiji or Craig’s List. Also, consider contacting an estate liquidator, who can appraise, price and sell off the contents of your parents’ house. Although some seniors see downsizing as lightening their load, others find the process excruciating. They may be emotionally attached to some (or all) of their possessions and they might feel overwhelmed by having to decide what they should bring to assisted living and what should they sell or give away. The key to making downsizing as stress-free as possible is to start the process early—at least a couple of weeks, if not months, before the move—to allow for enough time to sort through every item. Remember that the sorting process will bring up memories and emotions in your parents, so it’s best not to rush it. On a practical level, one of the first things you should do is gather and safely store your loved one’s important financial, medical and legal documents and records. Once that is done, systematically go through each room, starting with a closet or a laundry room before moving on to bigger spaces like the basement or garage. 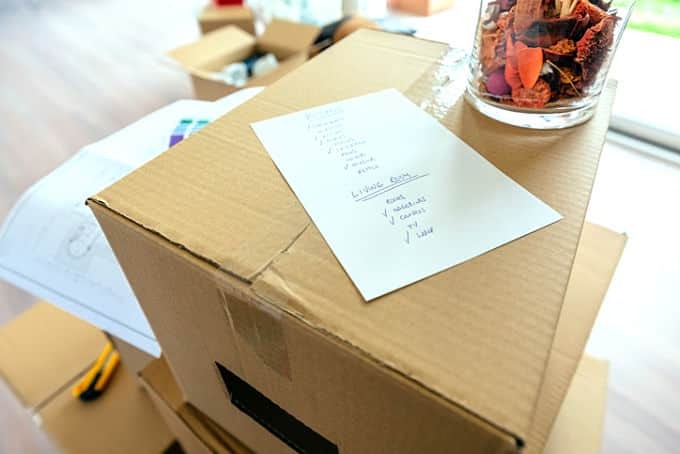 As you sort, place colored sticky notes on each item so that you can easily determine what to pack and what to or get rid of. For instance, put pink Post-It notes on possessions your parents plan to keep, orange on items they want to sell, and blue on those they wish to donate or give away. Yellow sticky-notes can signify items they want to throw out and green, items to recycle. Early in the process, you’ll also want to ask the senior living community for its recommended packing list and exact space measurements and to find out what items are already provided. Also, be sure to ask the community’s rules—it’s not uncommon for them to prohibit expensive jewelry collections. Note: If space allows, take a small filing cabinet or safe for important papers. Settling into a new living community can be overwhelming for any older adult—it’s like the first day of high school all over again. They’ll want to get to know their new living space, meet new people, and make a good impression—at the same time, they might feel homesick about the house and neighborhood they’ve left behind. Moving to a new home is a huge transition, so don’t expect that your loved one will feel comfortable in their new environment immediately. When they’re feeling blue, talk to them about what they miss. Even if you can’t help them change much about their living situation, a listening ear can go a long way to providing comfort. And don’t mistake the initial upset for evidence that the move was a bad idea. You may need to ask your parent to avoid making snap judgments and to do their best to be patient and take it slow. Remind them that once they’ve settled in and gotten familiar with the environment and the new schedule—and made some friends—they’ll likely feel much different about their new home. Finally, once all the boxes have been removed boxes and the closets organized, take the time to make your parents’ new living space feel like home. Nan Hayes, founder of MoveSeniors.com, recommends placing furnishings, accessories, pictures, clocks, and bath and kitchen items in a way that mimics the previous home. “[This] is a great way to help your loved one feel settled and reinforces their sense of self, empowering them to venture more readily into community,” she says. In all too many cases, a couple must separate after decades of living together, because one partner needs more care than the other person can provide. It’s not only hard on the couple, it can be devastating for adult children who want to help but feel helpless dealing with this forced separation. Fortunately, there are things you can do to ease the trauma. Before anyone moves out, talk to your parents about the ways they can keep in touch. For instance, the at-home partner might be able to eat dinner or lunch at the assisted living community with their spouse. Another alternative is for them to join their loved one for an on-site activity like cards or a sing-along. If your parent no longer drives, arrange in advance for a loved one or a paid caregiver to drive, so they get time together. “Even if it’s brief, at least they talk a bit, kiss good-bye, and off one of them goes,” says Mary Koffend, president and CEO of Accountable Aging Care Management. Of course, your parents might want some time for a little more than a brief kiss. Although physical intimacy might be a little awkward to address (understatement!) Koffend encourages adult children to have a straightforward conversation with the community’s administrators about arranging alone-time for the couple. Keep in mind that the community might be liable for falls or health issues that occur under their watch. Address concerns and see if you can set fair boundaries. Sometimes your best efforts might not be enough and you will need to engage outside support. “No matter how cooperative the facility is, no one can understand how bereft these couples may feel,” says Cheryl Woodson, author of To Survive Caregiving: A Daughter’s Experience, A Doctor’s Advice. She suggests that families encourage the parent who remains at home talk to clergy, counsellors and/or to participate in support groups with other spouses.